Practice Motor Skill Development the Classic, Fun, Japanese Way. 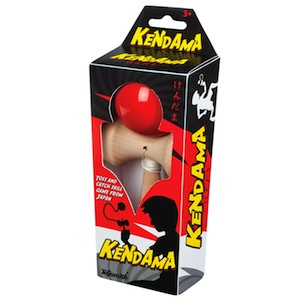 Kendama is a classic toss and catch skill game that originated in Japan. The brightly colored wooden ball is attached to the base with a sturdy string. The Base has 4 ways dfro you to develop your hand eye coordination skills. Try to capture the ball in any of four ways! There is The Spike (Kensaki) on top. The Big Cup (Ozara) on one side The Small Cup (Kozara) on the other side. And the Base Cup (Chuzara)Once you have mastered the beginner moves you can check out YouTube for your next challenge. The approximately 2.5 inch diameter Wooden Ball has a champhored hole to accept the Spike (Kensake). Balls comes in assorted colors. Bases measure 6.25 inches in length and made of are natural wood without a finish. Ages 3 and up.